Self-Care: Take time to check in with yourself. On the topic of self-care. I’m sure you’ve heard that phrase before, Take Time to Check in with Yourself. I know I have but have we ever taken the time to break down what that means? Especially as abuse survivors? I do use cliche’s here from time to time, but I always try to make sure they are relevant to my survivor journey and something that hopefully everyone who reads this blog can relate too. This one is no different because taking the time to check in with yourself is so important for those of us who’ve survived childhood sexual abuse, narcissistic abuse, or any other abuse. We were groomed not to put ourselves first, but checking in with yourself is a form a self-care as far as I’m concerned. Putting ourselves first can seem counter-intuitive. I mean our daily lives have us pulled in a million different directions, and usually the first thing to suffer is taking care of ourselves. A myriad of things consume our time, take all of our focus, and put us into a non-self-care route that is hard to escape. The kids have soccer practice, band practice, you need to run to the grocery store, you have a project at work that’s coming due. You have to make dinner for the family, do a couple of loads of laundry, and pack the kids lunches for school. Let’s not forget, for some of us; our daily lives may not be that busy, but we still don’t take near enough time to check in with ourselves. We spend time worrying about an upcoming doctor’s appointment, why the house hasn’t been cleaned lately, our family that is coming to visit that we’d just assume not see. Or, not the least of which, we suffer from depression and anxiety so much that we can’t even leave the house. That eats away at us daily, and rather than take the time to help ourselves heal, we all too often don’t have the energy even to figure out how to do that. No matter what type of schedule your daily life consists of, it’s so very important to time to check in with yourself. See how you are doing and take stock of where you are at in your day, in your life. 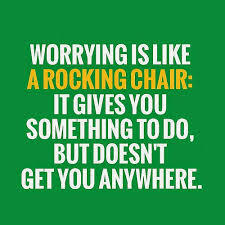 How is worrying going to solve anything? How is being anxious going to help me deal with this better? “I am going to stop right now and do some self-care, or I am going to do something I enjoy today (and then be sure and follow through). If you can rationally and realistically answer “no,” to question 2, then congratulate yourself! Celebrate the fact that you are feeling good and that you are having a good day. Perhaps even consider rewarding yourself with a small treat. If you take the time to check in with yourself and don’t worry about things you can’t control humming along swimmingly as they say, (whoever THEY are), it’s still good to check in and give yourself permission to be proud of yourself. You don’t have to be having a rough day, or be feeling anxious or worried about something, to check in with yourself. Think of it as “preventative maintenance” so to speak. The more we check in with ourselves even on good days, we build up our self-confidence and self-esteem. If you can’t answer “no” to question 2, then read the rest of that list and work through your feelings. Remember, worrying and being anxious does nothing but cause our stress level to rise and make a situation worse than it might be. It raises our blood pressure and keeps us feeling like we’re teetering on the edge of our sanity. That’s no way to live, and there’s no better time to start changing it than now. Immediately when you start to take stock of your feelings and emotions, you begin to focus on the here and now. Being mindful of what we feel can help us rationally look at ourselves in a way that gives us perspective and realize that often our anxiety and worries are not as justified as we think they may be. Our self-care suffers before we even realize it. Over time that reinforces a negative habit which becomes harder and harder to break. Do your mind a solid, give yourself a break, be kind to yourself, and check in regularly to stay on top of a good day or help turn the tide of a rough one. 40 something guy living with PTSD, Dissociation, and Anxiety as a result of a history of childhood sexual abuse. Music fan, rocker, all things 80's, and a Steelers fan. 0 responses on "Self-Care: Take time to check in with yourself."